Purpose: Demonstrate ability to select and retrieve the correct scented article. Equipment: Four identical scent-work objects. Exercise set-up: The exercise begins when the handler gives a single verbal and/or hand signal for the dog to stay in any position facing away from the article pile. Handler then places three identical scent-work articles of his/her choice on the ground 10 ft. (3 m) behind the dog and approximately 6-8 inches (15–20 cm) apart. 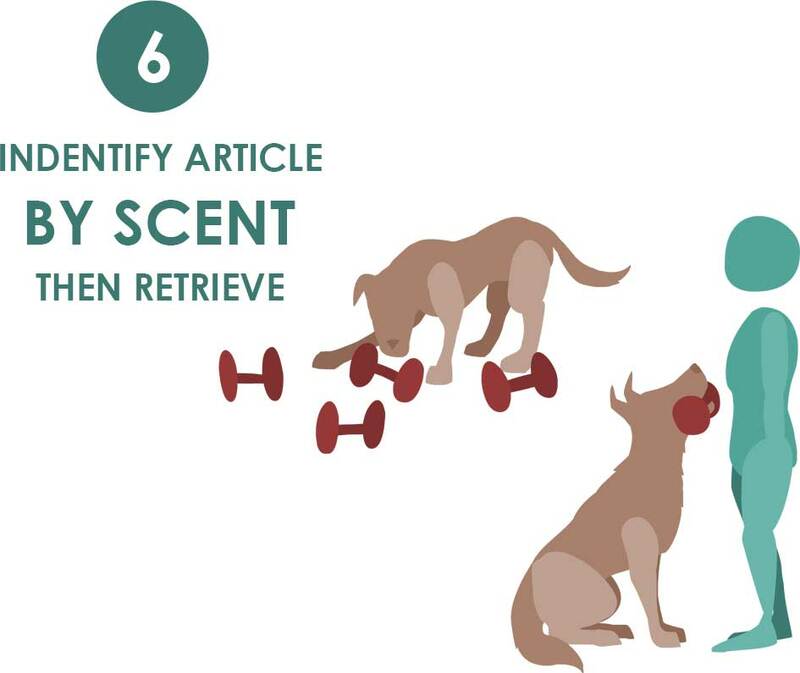 Dog must remain facing away while the handler places the three non-scented objects and then scents the correct article for approximately 10 seconds before adding it to the pile. Handler then returns to the dog and may offer his/her hand or a matching object to the dog before turning to send. After a 1-second pause, the handler gives a single verbal and/or hand signal for the dog to find the correct article. Dog may be sent directly to the pile (single cue to find the article) or the handler may pivot 180 degrees first before sending (single verbal and/or hand signal here to turn is permitted before the send cue is given). Dog must go directly to the articles, find the correct article and return directly to either front or heel position. The exercise ends when the handler takes the article. Non-qualifiers: Dog does not hold a position while the handler places the scent objects. Dog does not follow a single cue on the send or the turn and send. Dog does not return with the correct object without additional handler assistance or cues. Dog drops correct object on the way back to handler. Dog does not return close enough for the handler to take the correct object. Video does not permit the exercise to be adequately judged.